Planning a New Zealand golf holiday? Golf Vacations New Zealand specialise in arranging customised self-drive holidays for individuals and small groups. We work with you to prepare an itinerary that suits your timeframe and budget and can take care of all your accommodation, rental car, golf and activity bookings to ensure you make the most of your holiday. New Zealand is a great golfing destination, having one of the highest number of golf courses per head of capita in the world, offering plenty of variety and incredible scenery. With its temperate climate and friendly people, a golfing holiday in New Zealand is something special. 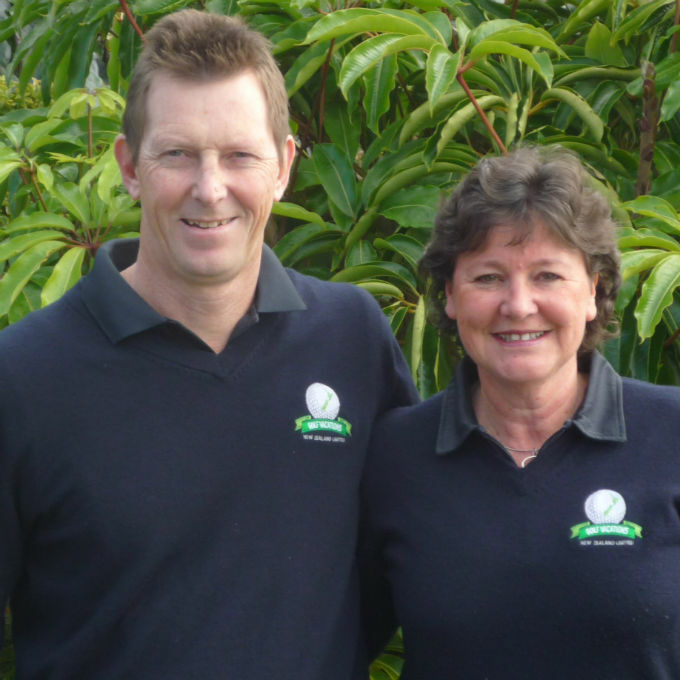 Golf Vacations New Zealand Ltd is owned and operated by Colin and Renee Wells. They have incorporated their love of travel and the outdoors, passion for New Zealand, addiction to golf, enjoyment of meeting with people and their organisational skills into creating Golf Vacations New Zealand. Well, we made it home safely after a wonderful experience in your country. Thanks for organising the trip. It was absolutely amazing and we enjoyed every minute of it. Your expertise in arranging our itinerary was fantastic. Thanks again. We will certainly use your company again. Thank you, Colin and Renee, for an experience that far surpassed all our expectations. The golf was exciting, the accommodations were superb and your hospitality was wonderful. Although we will be back, we look forward to having you visit us in Hawaii. Colin and Renee’s organisation of our golf tour and all the accommodation was brilliant and very efficient. We also stayed four days at Okura River Lodge and you could not find better hosts than Colin and Renee. Thanks for all your help. We plan to visit New Zealand again in 2015 or 2016 and combine it with a trip to Australia. We will definitely have you co-ordinate all of the logistics. We have also recommended Golf Vacations New Zealand to several of our friends at our club who are thinking of a holiday in New Zealand. Our pictures of the courses and accommodation really impressed them. Just a short note to say many thanks for a most enjoyable two weeks of golf on your 2014 South Island tour. Our group had a great time and please let us know of any future trips. Hope this finds you both well and once again many thanks. Many thanks for such a great holiday. We both really appreciate all your efforts to make the trip so enjoyable. The stay with you both at the beginning and the end at your lovely home [Okura River Lodge] was the icing on the cake. So many laughs and good memories. Our trip to New Zealand was great and we enjoyed it very much. The organisation via emails and all the helpful information have been excellent. You did a great job and even managed to organise good weather. We have been very happy and will always recommend your company, excellent value for money. As soon as we plan to come back we will contact you. Me and Flo want to thank you for the great vacation you organised for us in New Zealand. Locations were good, the golf was excellent and the tips you gave us on things to see and places to eat were priceless. Hope to see you again perhaps in New Zealand or if you make it to KL or Chicago at some time in the future. We both greatly enjoyed our stay in NZ and much of this is due to the inputs and preparations made by yourselves. Once again many, many thanks from us both to you both. Good to see you both again yesterday, and we can’t thank you enough for such a well organised golf holiday, everything went so smoothly, and especially great to have mobile phones and GPS. We found the folders amazing, so much detail, with all the maps, suggestions etc – way above anything we have experienced previously. Thank you also for the hat and towel. I want to again thank both of you for the fabulous golf vacation you provided Bill and I last month. The complete package of type and location golf courses selected, accommodations, food and overall attentiveness to our needs was wonderfully planned and executed. In addition the afternoon at Te Pohue and time at Wairunga provided a great opportunity to learn about New Zealand. You met and exceeded our expectations to a substantial degree. Plus you were both extremely pleasant and charming people with whom to spend 11 days. We very much enjoyed your company on and off the golf course. If I can ever provide a recommendation, or support in some way your business development efforts, please don’t hesitate to ask. Also I hope my review in the “Trip Advisor” was appropriate. We had a fabulous holiday in NZ, Nov. 2010. It was our good fortune that we found your website. It was so impressive that you answered us with a plan that really suited our needs. The itinerary you put together was perfect! From the minute we arrived you were in touch. You were both so professional and made our holiday so relaxing and fun. The transportation was so comfortable and you handled all the details from wineries to golfing, to dinners. You are delightful hosts. We will most definitely be back to do some more golf and tour with you. I personally really enjoyed working with Golf Vacations – there was nothing too much to ask, you were prompt getting back to me & rather helpful with everything, and you were fantastic when I asked you for something above & beyond to assist my clients getting some information. Thank you! Like all good tour operators, Renee and Colin are knowledgeable, helpful and they look after the details. But what sets them apart is their knowledge of golf, and perhaps more important is their understanding of the needs and expectations of golfers with their Type A, competitive and outgoing personalities. For future individuals or large groups considering using your company as a service I strongly recommend that they do so. The Cadieux’s and ourselves were extremely impressed with how well organized you were, and how easy you made everything for us. The accommodations you recommended were great and your hospitality was second to none. You both went the extra mile hosting a wonderful dinner at your home. We now consider you friends first, and a service provider as a bonus. We hope to come back to New Zealand and share time with you again. Thanks and good luck. For anyone planning a golf vacation in New Zealand, regardless of group size or handicap, Colin and Renee of Golf Vacations New Zealand Ltd is your ideal choice. We called upon Golf Vacations New Zealand to plan our five day golf trip around the Auckland area for our group of eight. Working around our schedule, Colin and Renee planned every perfect detail from safe, modern transportation to a great selection of golf courses, dinners after golf and even a birthday cake for a member of the group. How do you end a month long tour of New Zealand? You book your last four days with “Golf Vacations”. Golf Vacations arranged accommodations at a superb B&B, organized golf games at two different and challenging courses, winery tours and lunches, visit to “Sheep World” and daily dining at local area restaurants. Our package included transportation to and from all the venues including transportation to the airport for our flights home. Golf Vacations eliminated all the stress out of our final four days. Thanks “Golf Vacations” for your attention to detail. You made our stay memorable and we are looking forward to do this again in the future. I appreciate that we had great time in New Zealand. It was lucky that I could see nice place by you. I hope your business goes well and hope we can be of assistance in the future too.